The films of Henri-Georges Clouzot engage me quickly and totally. I don’t mean they pull me in—I mean they open the floor beneath my feet, and I drop. Down, down; ever swifter, into darkness uncertain. This is my journey as a viewer, and often the characters’ too. It is the journey of the heroines (if heroines they be) of Diabolique: Nicole Horner and Christina Dellasalle, who live and work as teachers at the same boarding school in France. They are involved with the same man, and together, they execute a plot to kill him. 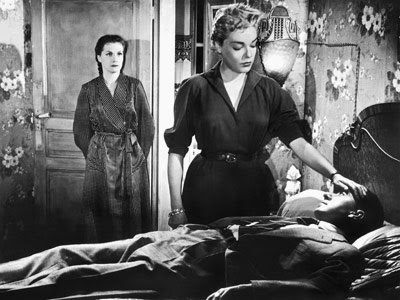 Michel (Paul Meurisse) is the school’s headmaster; Nicole (Simone Signoret) his mistress; Christina (Vera Clouzot) his devoutly Catholic wife. The three of them persist in a triangle created by Michel’s selfishness and inhumanity, dealt equally to both women—who, perhaps because of this, remain friends. Christina is moneyed. It seems unlikely that things will change until Christina dies of the heart condition that afflicts her—or Michel dies of something less natural. These details, collectively weird, are communicated in the film’s early minutes. Then we’re off. There’s a three-day weekend coming up—the perfect time to dispose of the hateful Michel—and Nicole and Christina take advantage. They lure him to an apartment hours away from the school, and through a combination of guile and chemistry, they drown him. Or appear to. Is Michel really dead? When the women transport his body back to the school, dump it in an algae-filled pool, then discover it missing, is it because they somehow failed to kill him? Unlikely, surely. Could he have risen from the dead? Unlikelier still, in a film such as this. But as things begin unraveling for Nicole and Christina, as they grow more superstitious and paranoid, we begin to ask ourselves: what kind of film is Diabolique? The answer determines what we’re prepared to accept. Diabolique is based on a novel, Celle qui n’était plus (She Who Was No More). 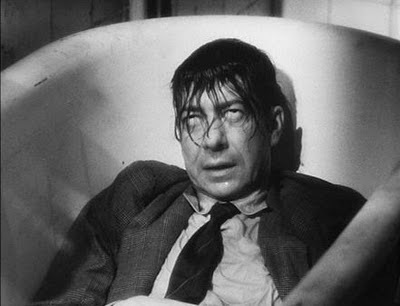 Alfred Hitchcock supposedly tried to buy the rights to it, and you can see why. Like several of Hitchcock’s films, it’s a story of deception and persecution, in which the position and purpose of the lead characters seem unstable. Clouzot even adds an icy blonde in Signoret. But it is most Hitchcockian in the way it toys with the viewer, turning our preconceptions about genre against us. Diabolique opens with the promise of a complex relationship drama; turning quickly into something between a caper flick and True Crime, as we observe, with fascination, Nicole’s clever plot to eliminate Michel—involving expert timing and an intuitive sense of the psychology of those around her, whether they’re involved in the murder or merely incidental to it. Transporting the body home—in a wicker chest, in the back of a battered hatchback—proves fraught. The women are nearly discovered several times, and now the film grows tenser, and we expect more near-misses. We get them, but in a different way: through the appearance of the seemingly jovial Fichet (Charles Vanel); a former police commissioner who discovers Christina inquiring at the morgue and offers to take on the case of the missing husband. He’s so insistent, and she, so reluctant, that we’re convinced he’s on to her. Suspense. As the likelihood of Michel’s survival shrinks, so grows the list of clues that he is, in fact, alive; his face even appears in a class photograph taken at the school. This seems too much. About this time, the scenes shot in shadowy corners multiply, and closeups of creepy hands doing suspicious things do too. Christina, guilt-ridden and terrified, now becomes the centerpiece of a horror film. I believe it was Clouzot’s intent to make us believe, by the end of Diabolique, that Michel could, possibly, rise from dead. Not because he never died, but because he was something supernatural. We need not assume it—we need only entertain it, for a second, and Clouzot has succeeded. This did occur to me, and I was surprised at how organic the notion seemed in a film so grounded in reality, at least in its first hour. Like the women in the film, especially Christina, I found my standards for plausibility shifting—only for me, it was because the movie itself seemed to shift from one genre to the next, and each genre, I knew, came with its own set of rules. There is really nothing steady or consistent in Diabolique—nothing you can tether yourself firmly to—except for a single fact: the fragility of Christina’s heart. In a film where even the deadness of a man seemingly killed in front of us is uncertain, Christina’s illness is indisputable. We see her buckle more than once, gasping for breath, clutching her chest. Doctors examine her, pronouncing her condition grave. So the only thing we know for sure is that, at any moment, and without much warning, our heroine could drop dead. Even our certainty rests on something unreliable. Only at the end the film, when secrets are revealed that really, you feel, you should have picked up on before, do you realize how little you ever knew about the characters to begin with. How much time do you ever spend alone with them? Are they not almost always together in some combination—mostly pairings—ac ting or chattering away to advance the story? Who are Christina, Nicole and Michel, inside? Maybe they have no true insides, anymore than they have a fixed outside. Maybe this is why Diabolique has such momentum: because it never pauses to let us discover these three, but instead, propels them, and us, ever downward, into new and uncertain places. 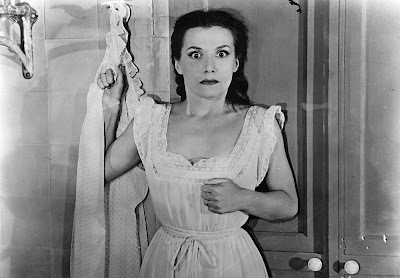 Diabolique screens Thursday, November 17 and Tuesday, November 22, 2011, at Toronto’s TIFF Bell Lightbox—part of the retrospective The Wages of Fear: The Films of Henri-Georges Clouzot. Diabolique is also available on DVD as part of The Criterion Collection. Click here to read my posts on Clouzot films The Wages of Fear and Le Corbeau.